Arctic Village is located in the Barrow Recording District, on the east fork of the Chandalar River, 100 miles north of Fort Yukon and 290 miles north of Fairbanks. The area encompasses 61.7 sq. miles of land and 8.1 sq. miles of water. 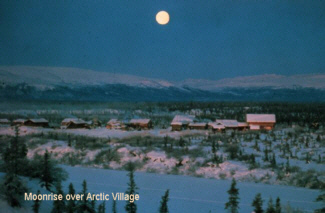 Arctic Village has a continental subarctic climate. Winters are long and harsh, summers are short but warm. The average high temperature during July ranges from 65 to 72; the average low temperature during January is well below zero. Extended periods of -50 to -60 are common. Extreme temperatures have been measured from -70 to 90. Precipitation averages 9 inches, with an annual snowfall of 52.8 inches. Until the 1950s, the Neets'aii Gwichin ("residents of the north side") lived a highly nomadic life. They traditionally used seasonal camps and semi-permanent settlements, such as Arctic Village, Christian, Venetie and Sheenjak in pursuit of fish and game. They traded with Inupiat Eskimos on the Arctic coast. There is archaeological evidence that the Arctic Village area was populated as early as 4,500 BC. Accessible only by air or river, Arctic Village is about 200 miles north of Fairbanks in the heart of the Arctic National Wildlife Refuge. The village has 152 residents (as of the 2000 census) who subsist through hunting, trapping and fishing. Then more permanent structures were built, a runway was carved alongside the river bed, and the outside world became more accessible. In 1863, Archdeacon McDonald of Fort Yukon observed that the Chandalar Kutchin were important providers of caribou meat for the residents of Ft. Yukon. Reverend Albert Tritt, a Neets'aii Gwich'in born in 1880, wrote that his people led a nomadic life, traveling to the Arctic coast, Rampart, Old Crow, the Coleen River and Fort Yukon in the 1880s and 1890s. With the advent of firearms in the early 1900s, family groups began to gather more permanently at several locations; there was no longer a need to disperse into small groups to hunt caribou. The first permanent resident at the present village site was Chief Christian in 1909. In 1943, the Venetie Indian Reservation was established, due to the efforts of several area villagers to protect their land for subsistence use. The first school was built in 1959. When the Alaska Native Claims Settlement Act (ANCSA) was passed in 1971, Venetie and Arctic Village opted for title to the 1.8 million acres of land in the former Reservation. Residents continue to use the community as a base of operations from which they pursue seasonal subsistence activities. A federally recognized tribe is located in the community -- the Arctic Village Traditional Council. 92.1% of the population are Alaska Native or part Native. The Neets'aii Gwich'in of Arctic Village lead a subsistence-based lifestyle. The village council is combined with Venetie.